In this Thursday Therapy episode, The “Weight Psych” Glenn Mackintosh takes you through the key topics covered in his flagship “Twelve Month Transformation” program, shows you how you can register for workshops (TMT), online (TMT Online), or both (TMT +), and gives you his 3 top tips on having a TRANSFORMATIONAL year! Welcome to Thursday Therapy the question were answering today is, “what is the 12-month transformation?” Hi everyone I’m Glenn Mackintosh the weight psych and the question we’re answering today comes from Kylie who asks, “what is the 12-month transformation please?” Kylie I’m glad you asked. 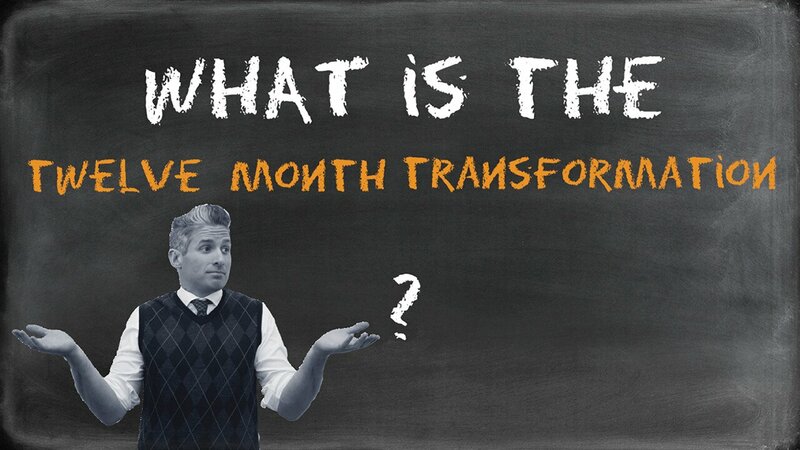 Questions about the 12-month transformation or the ‘TMT’ as we like to call it and probably the most common questions I get from my clients, from people out there in the internet and from health professionals, so very keen to answer it. The 12-month transformation is really a combination of over 10,000 clinical hours I’ve spent talking with clients around these issues, probably two or three trees worth of clinical research trials read and some really wonderful conversations with some world-leading health professionals. It’s our flagship program at weight management psychology and for me it’s a real labour of love. We’re going to cheat a little bit because we’ve just done a promotional video for our website on the TMT, and no one explains the TMT better than previous me so what we’re going to do is we’re going to include that in there because it will really give you an understanding of the five topics that the TMT is based on and how you can get involved. Let’s have a look. Hey everyone, I’m really excited to bring you some information about 12-month transformation 2017. As you can see from our flyer there’s quite a bit of information on here so if you’re on our website you can click to download the flyer or you can click through to the various links to learn more about TMT, and how it can help you – but I wanted to take you through the broad strokes. Basically the 12-month transformation is a non-dieting approach to taking care of your eating, your movement, your weight, and your body image throughout the course of 2017. We believe that psychology is the missing piece of the weight management puzzle, so there is a lot of psychology involved throughout the course but we believe there are other areas to the weight management puzzle as well so it is an interdisciplinary program and there are plenty of options to connect with nutrition professionals, exercise professionals, and for us to work with your medical professional. Let me talk you through the five workshops that are really the heart of the 12-month transformation program. The first workshop is called foundations for success. Unfortunately, over ninety-five percent of diets fail in the long term, so we want to avoid any of those common pitfalls and make sure you’re setting yourself up for success. We do that with setting realistic, holistic, and sustainable goals, helping you learn to set goals to reach those goals and then look at your important weight management values – the reasons why you’re doing this process and when you do this you develop a really balanced, holistic, internal motivation to take wonderful care of yourself throughout the year. The second workshop is called mind-set for transformation and this is where you learn the seven key mind-sets for weight management success. Not only that, you learn that you’re not going to rely on willpower anymore, you’ve done that in the past, you’re going to rely on skill power so we teach you the skills to achieve these mind-sets for lasting weight management success. The third workshop is Naturally Healthy Habits, and this is where we help you make sure you’ve completely let go of fad diets and unsustainable exercise regimes and developed a real love affair with moving your body in a way that is right for you and have become an intuitive eater – who is someone who eats well naturally, without trying. In the next workshop, Freedom from Emotional Eating, we help you transcend emotional eating completely. We do this towards the end of the program because for a lot of people when you have that initial burst of motivation you can just not emotionally eat, which is different to having overcome emotional eating where you’ve learned new coping strategies to deal with the whole variety of feelings you experience. In the last workshop, Love Your Body Healthy, we make sure we deal with any remaining body image issues. We live in a world today where unfortunately it’s normal to not like your body but at the same time we’re getting bigger and bigger. So, all this body shame and hatred and criticism doesn’t help us take great care of ourselves. In this workshop, we make sure that you’re taking great care of yourself from a place of love. So now that you know more about the program let me talk you through the main options. The first option is the 12-month transformation. As we always do we’re running it in Brisbane with our good friends Tree of Life nutrition at the weight management psychology home office. But I’m happy and pleased and proud to announce that in 2017 due to popular demand we’re actually running a 12-month transformation Gold Coast with my nutrition clinic Atkins health and we’re doing that at Bond University. You can sign up for the TMT at Brisbane or the Gold Coast for five easy payments of a hundred dollars and you can do that using the links below. As we’ve also run this year, you can do the 12-month transformation plus, which is a combination of the five workshops, plus online courses that are really designed to help you embed, implement, and sustain the changes that you make in the workshops. You know how you do workshops and then you just forget everything? The online courses are really designed to help you bed down that information and turn it into lasting transformation. You can do the 12-month transformation plus in Brisbane or at the Gold Coast for five easy payments of a hundred and fifty five dollars. The third option that I’m really excited to bring to you is the TMT online. I’ve been really heartened that I think people are ready for our message. A weight inclusive, non-dieting approach and we’re starting to develop a following all around the world now, so we’ve decided to do a 12-month transformation course completely online and it consists of just doing those online courses which include all of the workshops, plus all of our group support which is absolutely transformational for people who want to make these changes from the comfort of your own home. You can sign up for the TMT online using the links below for just three hundred and eighty-nine dollars. Guys there is a lot to the program, so if you have any questions please give us a call, and we’re coming to the end of our 12-month transformation 2016 and it is a wonderful time to see and hear about people’s beautiful experiences and transformations. It’s something that I’ve obviously put a lot of my brain power but a lot of my heart and soul into developing and we really feel like we’re onto something wonderful. Every year it gets better and better so we would love to have you along for the ride in 2017. So hopefully that lets you know a little bit more about the TMT and every year we improve the 12-month transformation. So, I wanted to let you know about some of the things that I’m really excited about for TMT 2017 in particular. The first thing is the TMT Gold Coast, which is really cool and the advantage of that for everyone is that if you happen to miss one of your sessions, say you miss a Brisbane session because you know life happens and we all get busy, then you can make it up at the Gold Coast and vice versa which is really cool. The other thing is we have is the online courses so for people who are doing the TMT plus, if you do miss a session you can make it up via our online courses and we’ll really work hard in a great supportive environment to help you really implement everything from the workshops. Sometimes you do like face-to-face contact too so we’re doing small group intensives that are optional and they work after every workshop to help you really bed down those ideas in a way that’s right for you, plus give you some really good nutrition and physical activity advice all from a non-dieting perspective. In some recent E-mails, back and forth with our email list we’ve been discussing that weight management can be a challenging area and there is this common feeling of feeling as if you’re struggling even among some people who are actually doing fairly well. So, I gave the email list my three top tips on how to have a more healthy, happy successful 2017 the first tip was to do the work. In our experience, this is the key. People who are the real success stories with WMP are really good at doing their homework. The second thing is to get support. I often talk about weight management being a team sport, and as part of your team it’s really important to have the psychologist, a dietician or nutrition professional and exercise physiologist or PT and a medical doctor and sometimes if it’s part of your team a surgical or, medical specialist. So, we’ve got to get the right team in your corner. The third thing is to do it differently. As Einstein said, “the definition of insanity is doing the same thing over and over again and expecting different results.” So, I really hope that that’s my wish for you for 2017, to do the work, to get great support and to do things differently. Now while I can’t make you do the work that’s the part that we can’t do for you. The 12-month transformation offers you a wonderful support team dedicated to helping you reach your goals in 2017, and a really new path forward. So, I really want you to consider joining us, whether it’s in Brisbane, on the Gold Coast or in our first ever online program and here’s to your transformations in 2017. I’ll see you at our next Thursday Therapy. Hey Buddy!, I found this information for you: "EPISODE 20 The Twelve Month Transformation – A non-dieting approach to weight success". Here is the website link: https://www.weightmanagementpsychology.com.au/episode-20/. Thank you.